Reinvent your outdoor lounge experience with this contemporary 3-piece bist.. Whether you're lounging at a park, beach, or the comforts of your home deck..
A blend of outdoor relaxation with cozy comforts is provided by this 3-piec..
82" x 26" x 36"HAluminum FramePE Resin Wicker.. Enjoy a day in the sun with this spacious padded fabric chaise! Constructed..
32" x 28" x 26"HAluminum FramePE Resin Wicker.. Along with the matching oval table, these fabric cushion arm chairs allow .. Along with the matching oval table, these fabric cushion arm chairs with r.. Along with the matching oval table, these tall wicker arm chairs allow for.. Along with the matching oval table, these tall wicker arm chairs with rock.. If you enjoy hanging out under the sun, this contemporary outdoor chair pro..
Change up the scenery and enjoy a day in your backyard! Style your outdoor .. Relax and sit back in this low profile arm chair. Place it on any patio or ..
Make it easy to store and organize toys in the playroom with this cute arm ..
Add an extra seating area to your backyard with this charming outdoor patio.. Send the party outsidewith this handy serving cart! The sleek white finish ..
Take your afternoon nap out under the sun! Whether you plan to stretch out ..
70" x 69" x 59"HAluminum FramePE Resin Wicker..
With its weather-resistant materials and industrial appearance, this outdoo.. Outdoor Arm Chair P5041224" x 23" x 32"HSteel Frame, PE Resin Wicker.. 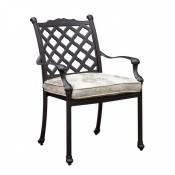 Outdoor Arm Chair P5041424" x 23" x 32"H.. Outdoor Arm Chair P5041624" x 23" x 32"H.. Outdoor Arm Chair P5043233" x 29" x 28"HSteel Frame, PE Resin Wicker.. Outdoor Arm Chair P5043733" x 29" x 28"HSteel Frame, PE Resin Wicker.. Outdoor Arm Chair P5045423" x 24" x 35"H.. Outdoor Arm Chair P5045830" x 28" x 34"H.. Outdoor Arm Chair P5046128" x 29" x 34"H.. Outdoor Arm Chair P5046827" x 24" x 30"HPlastic.. Outdoor Arm Chair P5047127" x 24" x 30"HPlastic.. Outdoor Bench P5042151" x 24" x 33"H.. Outdoor Bench P5042251" x 24" x 33"H.. Outdoor Bench P5042351" x 24" x 35"H.. Outdoor Bench P5045359" x 14" x 18"H.. Outdoor Chair P5016526" x 26" x 44"H..